BMW Motorrad UK appoints Datatag to offer additional security on new motorcycles. BMW Motorrad has joined forces with Datatag, the country’s leading provider of security marking solutions, to give BMW motorcycle owners an additional level of theft protection and peace of mind. From 01 January 2012, all BMW Motorcycles will be fitted with the Datatag's industry-leading system to deter theft, free of charge. Datatag’s advanced system enables the identification of stolen motorcycles and parts, thereby assisting the police in prosecuting motorcycle thieves and making BMW motorcycles less attractive to criminals. The Datatag system adopted by BMW Motorrad, unlike other less-sophisticated systems, has four layers of security: near-invisible ultra-violet etching, hidden RFID transponder tags, microscopic coded number dots for recognition and prominent, tamper-proof Datatag markings to provide a visual theft deterrent. As a result, Datatag is one of the few security marking systems which is fully approved by the Motor Insurance Repair Research Centre (Thatcham) and the Association of Chief Police Officers (ACPO). The advanced technology utilised by Datatag has also been recognised by the insurance industry. BMW Insurance, along with a number of other underwriters, offer customers a discount on their policy for having Datatag fitted. 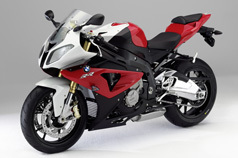 Adrian Roderick, general manager of BMW Motorrad UK, said "We understand that security is a concern for our customers. Whilst BMW’s motorcycle anti-theft systems have proven to be some of the best in the industry, and our motorcycles among the least affected by theft, any additional security that makes thieves think twice about stealing a motorcycle is a significant benefit to an owner. “Statistics show that BMW’s current factory-fitted immobilisers, available on all-but-one of our models, and optional alarm systems prove very effective. But the industry must do all it can to deter theft and also assist the police in prosecuting thieves once vehicles have been recovered. The industry-leading Datatag systems make motorcycles less attractive for criminals to steal and easier for the police to identify and return to the owner." Kevin Howells, managing director of Datatag, said "We are delighted that BMW Motorrad UK has appointed us as their preferred supplier. Our systems are the most complete and effective theft deterrent on the market today. This multi-layer approach ensures that when it comes to theft deterrent and vehicle identification, Datatag is the only choice: a fact confirmed by Datatag's 100% conviction rate when used in evidence by the Crown Prosecution Service." For more information on BMW Motorrad products and services, visit www.bmw-motorrad.co.uk. For more information on Datatag products and services, visit www.datatag.co.uk/motorcycles.php. A report for the Motorcycle Industry Association has confirmed that a security marked machine is up to five times less likely to be stolen than one that is not marked. Datatag has no annual fee and is transferable when a machine is sold. Datatag is the preferred security marking system in the construction and agriculture industry and is widely used in the marine, cycle and car industries.